A controversial poet, a scandalous divorce, a bizarre medieval-style stone tower, a love story unparalleled, a perfect bed to die in, a life of self-sufficiency, and waves bashing the shoreline—all of this is yours when you tour Tor House and Hawk Tower, the former home of poet Robinson Jeffers and his family located in Carmel, California. 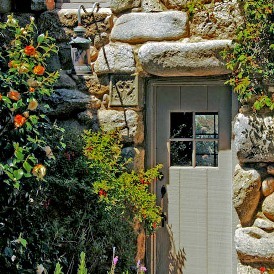 Much of Tor House and all of Hawk Tower were handcrafted using the stone masonry skills of Robinson Jeffers himself. A reclusive Jeffers hauled boulders from the beach below (many of which were in excess of one hundred pounds) in solitary agony. Seeing the majestic stone structures, you might say they recall his intellectual prose and poetry. As the tour progresses, you are swept back into the early twentieth century and the rugged life of Robinson and Una, his bride, as they carved out a life on this windswept portion of central California’s coast. Early 20th century pictures of the grassy slopes are surreal scenes compared to the multi-million-dollar homes that now cover the city. At Tor House, Robinson and Una would entertain artists and famous figures such as Edward Weston, Joseph Campbell, Charles Lindbergh, George Gershwin, Edna St. Vincent Millay, Ansel Adams and Charlie Chaplin, among others. It boggles the mind to imagine the conversations and ideas whirling about the living room of Tor House in those years. After exploring Tor House, you are led to Hawk Tower, built by Robinson at Una’s request. An inscription on a parapet reads “RJ, with his own hands, made me this Hawk Tower, 1924”. Your mind will be racing back and forth between the bizarre structure’s composition and quirky passageways and what it must have been like for the family to have lived and played here. On your way home, let your imagination form images of Robinson writing and building Tor House and Hawk Tower while Una managed the household and raised the children. Jeffers’ home and surrounding grounds, now a National Historic Landmark, are a perfect day trip destination from San Francisco. Reserve a tour ahead of time. You won’t likely be able to show up and wander in, as tours are docent-led hourly on Fridays and Saturdays from 10:00 am to 3:00 pm. Groups are limited to six. Children over 12 years old only. 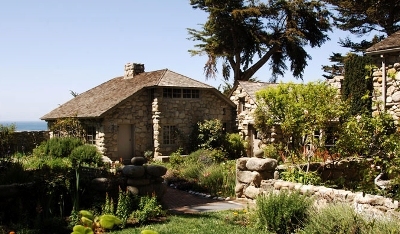 Location: 26304 Ocean View Avenue, Carmel, California (not the familiar Ocean Avenue that runs through the heart of town). Free parking is available on the street. For additional information on Robinson Jeffers’ art and life, check out: www.poets.org.